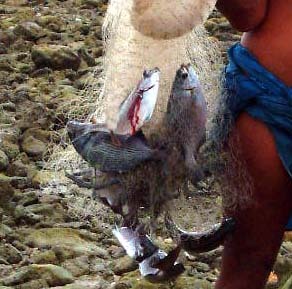 A throw-net fisher returns with his catch. “Fishing here is seasonal," Chief Taithau begins. 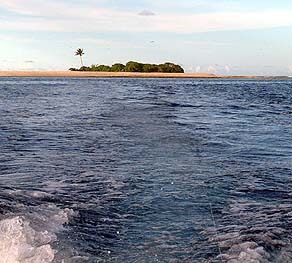 "During the summer the sea is calm, and we do bottom fishing inside the lagoon. Particularly for a type of fish, we call roahroah (Emperor fish). It’s season is during the summer when the water is calm. 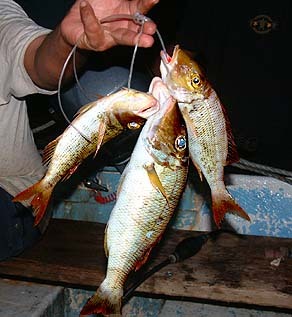 Other types of fishing can also be done but that’s the main type of fishing that is done at that time: We do bottom fishing during the summer, because during the Fall the water is rough and it’s not good to fish inside of the lagoon. During the Fall, that’s when we start receiving storms here, so other types of fishing can be done. That’s why fishing here is seasonal." “Usually during the summer, it’s calm,” Mariano adds, “so that’s why the common type of fishing done in the summer is usually bottom fishing: the canoe is anchored, because you have no power to push your canoe." "We use octopus for bait for this type of bottom fishing," Chief Taithau continues. "Before, it was strictly octopus; nowadays, people are often using the mackerel-like type of fish. But once you use that, then the fish will not bite on any other type of bait. "So that’s a problem nowadays. People tend to use that because that attracts more fish. But before it was strictly octopus, and fishermen got mad if they found out that someone used this type of fish for bait." Mariano demonstrated the kind of line with hooks (and a weight at the bottom) used for bottom fishing today. “An individual can go fishing during the summer, but before that happens, when they say, ‘we’ll fish the first fish of the season,’ then the whole community goes. All the men go out fishing. And on land, there is a counterpart to that fishing: breadfruit. The ladies will pick breadfruit, in return for the fish. And the food is brought down to the Men’s House." “There’s no real ritual during the first fish of the season. It’s only sort of the exchange of food, fish and it is this, it’s distributed throughout the community. But after this occasion, then each individual is free to go and fish for his own. 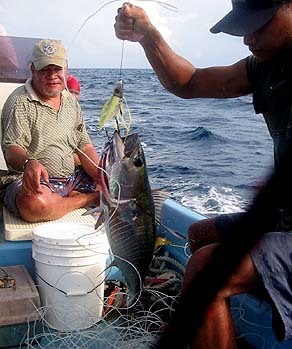 And they can fish to send to other relatives on the other islands." "During the Fall season, when the stormy weather comes, you have all the speed you can get!" Mariano says. “There was this story about this boy—young, teenage boy—who was really trying to go out with the older boys, to go out trolling during this Fall season. And he kept on begging and asking permission from his mother if he could go join his brave friends. "And the mother said, ‘Are you sure you’re ready to go out and go through those waves?’ and he said, ‘Yes, I’m sure.’ And so the mother said, “O.K. then face this way—face me and look at me.’ So the son came and was really looking at the mother, and the mother quietly stuck her fingers out straight, and all of a sudden jabbed them towards the son’s eyes. And the son blinked. "And she said ‘you see, you’re not ready to go out yet. Because my fingers are like the waves: it will be coming towards your face like that'." Trolling off Yeweech. With motor boats, it can now be done during the calm summer season. "Apportioning fish catch on Satawal." TTPI Archives photograph by Mike McCoy. “For the different kinds of line fishing we do—trolling and bottom fishing, inside the lagoon—we just use hooks, but different sizes of hook,” Barney explains. “Before, we used to make our own hooks, out of small bits of steel. And you form it, make hook out of it. 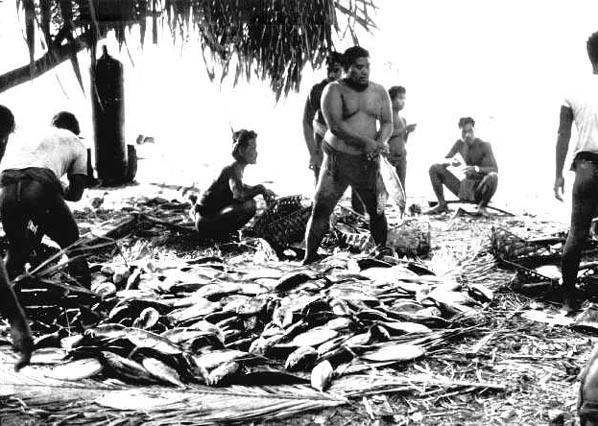 "Because before, we didn’t have many fish hooks coming in to our islands, so sometimes our people went to Angaur or Palau, and they got many sizes of steel wire, and they brought them over and they filed it and filed it and made their own hooks. A yellowfin tuna landed during trolling season. 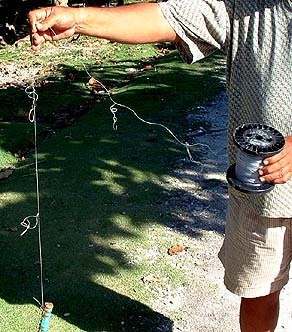 Old-style trolling lures, made from sea shell and turtle shell. “People were still using those old trolling lures, and making them, when I was young” Mariano says. “How they were made depended on the individual, or for what purpose. For bottom fishing or trolling, then they had to shape it out of a piece of shell, or out of a piece of the turtle shell. "You can also shape the hooks with barbs, from pieces of shells, and attach to it. Some people use fish bones for hooks. 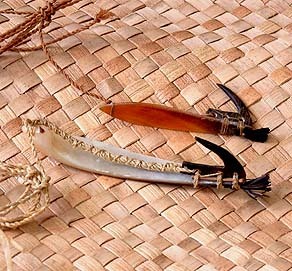 "After the War, people were still making their own hooks. But then they were lucky because they had all these wires available from after the War. People shaped their own hooks from those." “When the men going fishing," Lourdes says, "if they take one small boy and they take one or two coconuts for the kid, and they would go fishing until the sun goes down, and then come back. During that time, they never eat. If they have coconuts, they can drink. All day, they don’t eat. And though they have fish, they never eat fish until they come back. And they put only octopus on their hooks. "But now, when they go fishing, they take shoyu and vinegar and they start eating sashimi on their boat. And when they finish with the bone, they just put it over the side. Just throw it away, in the water. Now, we have plenty of sharks." “Before, they’d go and fish until the sun went down and come back, especially in the summertime, they say that they’re going to get some fish we call roahroah, only during summertime. 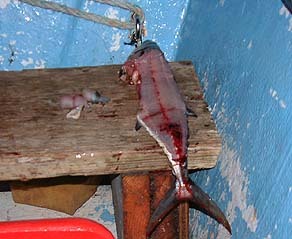 Then they start this eating on the boat with this kind of fish, and now only two or three, drop your hook and the shark will come. “When you go fishing, what we call dowadow, when you stand on the beach and use the line and pole, the men used white coconut meat on the hook, and those hermit crabs. But now they put fish—and we have plenty sharks. People have not been getting attacked by sharks, but very soon. In Falalop, somebody, a shark bite their legs, and they sent him to Yap." “We use torches when we go at night to catch flying fish” Juanito says. “Only one canoe will go, and that one canoe will have these men who can make magic. And we even had a local magician to put magic in the channels, in the water. And after maybe one month, then people would start going out fishing. “Sometimes it works. Maybe one season you go out and have a lot of fish. Now we know the fish are going down that way and coming up this way at different times of year. Going down west, coming up east, going down on the southern side, coming up on the northern side." “Other times, they go out, make magic, put the medicine, no fish. But we didn’t blame the fish. We blame the magician. During that whole month, he will stay here in the men’s house. Plus the crew, they don’t go home, they bring food. “Another thing about these magicians, they wear only one thu. Once he puts it on, that thing stayed on for that whole month—going out in the water, coming back until, that thing is dry and stiff. After that he got really sore, painful open sores around the waist. 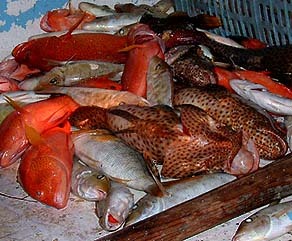 Now we invite you to look at local terminology regarding fish and fishing as presented in this chapter's Language page. Our next chapter focuses on the Land.